This animation type is used to scale an object, corresponding to the entered value. 2. 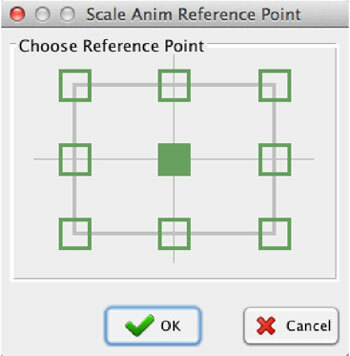 Set the tag, Min, and Max limits; percentage of scaling; and the reference point. 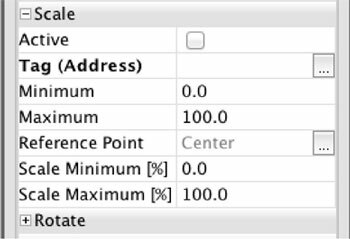 If the tag value is at its minimum value, the object will be scaled to the defined scaled minimum. When the tag value is at its maximum value, the object will be scaled to the defined scaled maximum. Size animation changes the real size of the object, while scale animation applies a scale transform to the given object. If you have a rectangle, for example, it is defined by its coordinates, width, and height. When we apply size animation, we are changing the width and height parameters of the rectangle. When we apply scale animation, we are setting the scale transform of the whole object.